A few years ago, while I was talking to a teacher in my children’s school, she mentioned a problem that had been brought to light. Apparently theft was occurring, which involved student’s lunch items being taken from their lockers. However, when they discovered who was taking the items, the reason why broke their hearts. Apparently, the student was not getting breakfast at home and rarely had enough to eat at lunchtime. Out of desperation, she was stealing food from the other students. Thankfully, the staff had banned together and was now providing the student with much needed food. The story is heartbreaking. However, it is a reality here in Canada. One in six kids, right here in Canada, are food insecure. I can’t imagine my girls going without food and we need to change this, for the better! Thankfully, Toonies for Tummies is doing just that! When you shop at our participating retailers, from February 5 – 19 you will be asked to consider donating a Toonie. Thankfully, 100% of the monies raised at the till will be donated back to local programs. To help ensure the funds make their way to schools in your community that will most benefit from your generous support, they will be working with various agencies who oversee breakfast and nutrition programs to identify local schools in the neighbourhood of participating stores. You can go online and see the various schools / communities that are benefitting from the monies raised. The goal in 2015 is to raise $1,000,000. 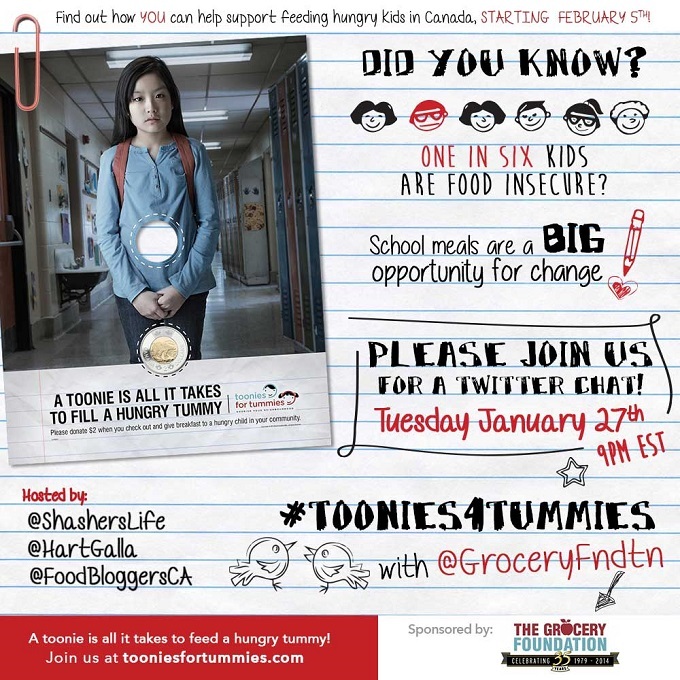 Make sure to join the #Toonies4tummies Twitter Party at 9pm EST on January 27th! Lend your voice to the conversation and I look forward to seeing you there! I fully support breakfast programs for children. It is nice to see that 100% of the money raised goes to help those in need. Great post!